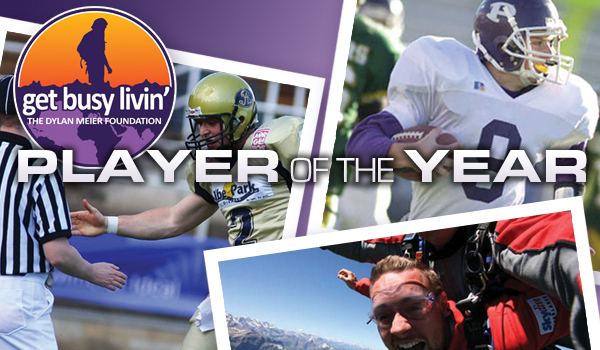 Kpreps.com is pleased to announce the finalists for the eighth annual Get Busy Livin’ – Kpreps Player of the Year Award in conjunction with the Dylan Meier Foundation. The 2018 award finalists include Dylan Downing of Bishop Miege, Jace Friesen of Basehor-Linwood, Gage Friess of Parsons, Hunter Igo of Derby, Max Seibolt of St. Thomas Aquinas, and Trey Sides of Phillipsburg. Stag linebacker Dylan Downing was a mainstay in Bishop Miege’s run to its fifth straight state championship. A two-time Kpreps all-state selection and the 2018 Defensive Player of the Year by Sports in Kansas, Downing also collected first team all-Eastern Kansas League and Top 11 All-State in each of the past two seasons. Miege won the Class 4A title suffering only regular-season losses to powers Rockhurst (Mo.) and eventual 5A champion St. Thomas Aquinas. Downing started for four years, and coach Jon Holmes labeled the senior “a great ambassador for our program and school.” Downing, a team captain this year, volunteers at the Don Bosco Center and assisted in youth sports camps in basketball and football. “Outside in the community, of course you need to help out with everything you can do,” he said. He plans to play for University of Kansas. Last year, Dylan paced the Stags with 131 tackles, 49 more than any other player. For his career, he recorded 403 tackles, including 39 for loss. Basehor-Linwood senior defensive lineman Jace Friesen was a team captain and the Bobcats’ best defensive player. In a rarity for a defensive lineman, Friesen, known for his motor, led 10-2 Basehor-Linwood with 80 tackles, along with 22 tackles for loss and 8.5 sacks. He was one of 16 seniors on the Bobcats’ roster. Jace was the Defensive Player of the Year in the newly formed United Kansas Conference and earned Kpreps Class 4A all-state honors. Friesen is a National Honor Society member, on the Student Leadership Team and a member of the Basehor United Methodist Church. Friesen called being nominated for the Get Busy Livin’ Award a prestigious honor. “Beyond the on-field exploits Jace is a man of incredible character,” coach Rod Stallbaumer said. As well, Friesen assists in the grade schools several times a week and has a 3.8 non-weighted GPA. He is expected to play for Kansas State, his dream school, as a preferred walk-on. Friesen is a fifth generation Wildcat. One of his cousins is Jon McGraw, a Riley County graduate who was a standout for the Wildcats and played for the Kansas City Chiefs. Friesen’s dad is a wildlife biologist and enjoys being outdoors, including hunting and fishing. Friesen credited his father for instilling hard work, adventure and curiosity. Friesen has done significant research into the Get Busy Livin’ pillars. “Just living life to the absolute fullest every single day,” Friesen said. Friesen started a bone marrow registry at the Basehor Car Show to assist a grade school student, Westin Brown, from the community who has leukemia. Friesen set a goal of getting 100 people swabbed for the Gift of Life organization. Brown underwent chemo this fall and is now going through a transplant. Friesen’s grandfather played at Kansas State and passed away from leukemia. For Brown, he organized the seniors to design football shirts that brought awareness to Westin’s fight and had the entire team sign a football. “I wanted to do everything I could,” Friesen said. “Jace essentially adopted this kid and has visited him often this fall and sent videos of encouragement throughout the season,” Stallbaumer said. Parsons quarterback Gage Friess helped the Vikings enjoy great success for a long struggling program. After he battled through injuries as a sophomore and junior, this fall Friess cleared 2,000 passing yards and 800 rushing yards and accounted for 34 scores, including 28 passing. Friess led Class 3A in passing yards and passing scores and earned Kpreps Class 3A all-state honors as Parsons won its first postseason games since 1976. One of the biggest surprises of 2018, Parsons finished 8-3, a seven-win improvement in the first season under coach Kurt Friess, Gage’s father. It marked the school’s second all-time regional plaque. “Gage Friess is one of the most positive hardworking teammates any coach at PHS has ever had,” coach Friess said. A team captain, Friess collected regional championship MVP honors in football. In state track, Friess has qualified in multiple events. He is the class valedictorian and football team MVP. Friess is active in his church and sang for years with his grandmother in the choir. Friess has helped elderly church members with occasional duties, such as yard work. He assists the local youth groups with referring youth soccer games and volunteers for nearly all community events. Friess wants to attend the Air Force ROTC program at Kansas and then train to be a pilot in the Air Force. Derby’s Hunter Igo was second team all-league in all three phases, a collective effort that led him to Top 11 All Classes honors for the Class 6A state champion. A Fort Hays State signee for football and baseball, Igo played quarterback, safety and returner. A team captain this fall, Igo earned offensive MVP after he took over at quarterback for an injured Grant Adler for a second straight year. Derby earned titles in ’15, ’16 and ’18 with a runner-up in ’17. Igo was already banged up entering the 2017 state semifinals against Wichita Northwest. Clark was uncertain whether Igo would play. Then, Igo hurt his toe. The 5-foot-10, 165-pound Igo then ended up throwing for 150 yards and rushed for 150 in the second half. In 2018, he passed for 1,068 yards, rushed for 931 and accounted for 30 scores. Igo said wanted to try new things and take opportunities, just like Meier and what the Get Busy Livin’ award embodies. “You want to go try something new,” Igo said. This summer and fall, Igo spent eight hours working on the Convoy of Hope, which provides young children with supplies and clothes at the beginning of the school year. One Saturday after a game, he went to the Children’s Hospital and spent three hours with kids. One Sunday this fall on Derby’s day of service, he helped clean up an elderly ladies’ lawn. He has assisted Clark with many DARE graduations at elementary schools and has frequently worked with special education students. Aquinas strong safety Max Seibolt continually worked hard throughout his career and had the opportunity to first start as a senior. Seibolt earned first team all-Eastern Kansas League and honorable mention all-state. He earned Most Inspirational for the Saints, which went 12-0 and won the Class 5A state championship, the first football title in school history. Seibolt has collected the Presidential Service Award for more than 100 hours of community service. He has been on the president’s honor roll five times and the honor roll one occasion. He is expected to earn induction into National Honors Society and National Art Honors Society. As well, Seibolt has a zest for life similar to Dylan Meier. He loves adventures and has been to both coasts as well as the mountains. His favorite trip was to Leesburg, Fla., where he helped clean a neighborhood. He helped with building, housing, painting, cutting down trees, cleaning up yards and getting to know the locals. Seibolt is committed to fitness and looks to go to the gym every day. He is part of the executive student council at Aquinas and serves as a peer mentor, senior ambassador and part of the Aquinas Key Club. He plans to continue his academics at Nebraska. Few current names have been as synonymous with success as Phillipsburg’s Trey Sides. The senior was a four-year starter at quarterback and point guard. In the spring, he has excelled in golf and track. A basketball commit for Division I Jacksonville, Sides helped the Panthers capture state football titles in ’15 and ’18 – the only two football crowns in Phillipsburg history. Sides did not lose a game as the starting quarterback in his two seasons of high school. Sides was the 2018 3A Basketball Player of the Year and led the Panthers to a state runner-up finish. In golf, Sides has qualified for state every year, won the regional in ’17 and was first team all-state last spring. Additionally, he has run on the 400 relay that has taken fifth and fourth at state. Phillipsburg football/track coach J.B. Covington said Sides has a great work ethic and high moral standards. Sides has served as the anchor for the school’s TV program the last two years and on the school’s leadership CORE team and a National Honor Society member. “He continues to be actively involved with our school's breakfast buddies program for disadvantaged youth,” Covington said. Sides is actively involved with the United Methodist Church, including the youth program. He volunteers in many community youth activities, including referee and summer sports camp instructor. Sides works for the local optometrist and as the summer little league baseball program as an umpire and on field maintenance. Sides served as a volunteer for the youth track and field program last year, too.